Iconic coaches (Krzyzewski, Auriemma, Calhoun) and future legends alike (Self, Few, Hoiberg, Izzo, Miller, Jacobson, Prohm) are all present in this video to show you how defense wins championships. In all, 25 different defensive drills will show you new ways to improve your defensive strategies and player technique. Utilizing both individual and team-based shell drills to build reactionary habits, these drills cover all facets of half-court defense, including on-ball pressure, help and recover, close-outs, rebounding, denying straight-line drives and face cuts, cross-screens, dribble hand-offs and more! Discover 13 defensive technique drills designed to hone the skills needed to play hard-nosed individual defense. Boxing out, jumping to the ball to prevent driving lanes, stunts, close-outs, halting straight-line drives, on-ball pressure, tracing the ball, etc. are all on display as the various coaches stress the importance of the individual component involved within the team defensive structure. Jim Calhoun (2-on-2 Rebounding) - Develop the technique necessary to keep opponents off the glass with dominant block outs. Mike Krzyzewski (Zig Zag Series) - Coach K's Zig Zag series includes three variations of this defensive slides drill that emphasizes disciplined full court pressure defense. Fred Hoiberg (Rebound vs Pad) - This drill will get players used to the physical battles that occur in rebounding situations. 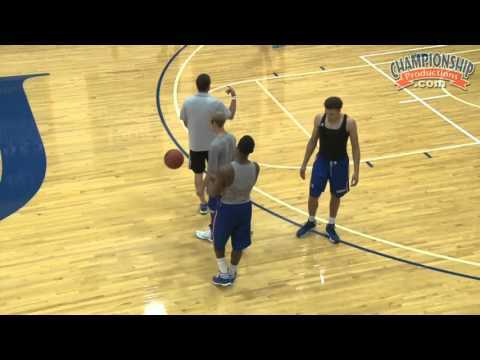 Bill Self (2-on-1 Closeouts and Guarding Cross Screen / Down Screen) - Discover the next level of the old classic "keep away" to drill the fundamentals of ball pressure. An elevated version of 4-on-4 shell, the guarding screens drill shows you how to defeat the common screen-the-screener strategy used in many offenses. Mark Few (3-ball Closeouts and Snakepit) - Coach Few's drills focus on defensive footwork to cut off dribble drives in either direction. Steve Prohm (Pick and roll defense, 1-0 Closeouts, 2-0 Help Side Closeouts and 2-on-1 Transition) - The pick and roll training develops hedging hard through all screens and communicating early. For closeouts, the focus is on high hands and denying back cuts. Ben Jacobson (Clipper Drill, Front the Post and 1-on-1 Defensive Drill) - The Clipper drill works on closeouts, forcing the ball to a side and taking away air space once the dribbler picks up the ball. Coach Jacobson trains his players to use their feet to get to the high side of the offensive player in the post. The 1-on-1 drill focuses on balance, footwork and movement. In the remaining 12 drills, each coach uses 2-, 3-, and 4-man shell drills designed to teach help responsibilities, off-the-ball spacing, defending block-to-block screens and hand-offs, awareness of the low post weak side "rover," playing the gaps, defending cutters, etc. The coaches stress the importance of the defensive groups to work in tandem and with continuity in mind and motion. 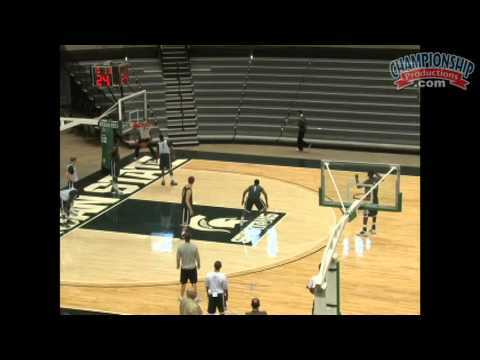 Geno Auriemma (Instruction of Shell / 4-on-4) - Covers basic alignments to put your players in the right spot to help prevent dribble penetration, deny passes, or apply pressure as the ball is moved around the court.